Do you like Super Mario 63? Share it with your friends. "Super Mario 63" is one of the most popular games from the history. Its hero is a funny man with moustache, red cap and blue trousers. It regularly offers incredible adventures to all players of computer games. 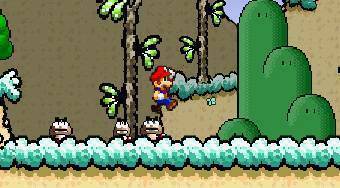 Mario must deal with attacks from many enemies. He is attacked by turtles, lizards and other creatures. He eliminates the enemy by jumping on the enemy's head.